For the savvy sipper who likes to save, we strip off the accessories and get you straight to the goods. Our bulk pyramid teabags feature 50 corn silk pyramid teabags, each filled with 2 grams of whole leaf breakfast tea. Our breakfast tea is described as a wonderfully traditional old friend. Smooth & mellow with a sweet finish. The Teatulia® Story Our award-winning hot and iced teas are responsibly sourced from our own USDA-certified organic tea garden in Northern Bangladesh. At 3,000+ acres, we have one of the largest organic tea gardens in the world. We're not just sustainable-we're regenerative. By using only natural farming methods, we're improving the soil and rejuvenating the land for future generations. Teatulia®'s organic tea garden was designed to create jobs in a remote and impoverished region of Bangladesh-we wanted to do something that would make a difference for the land and its people. 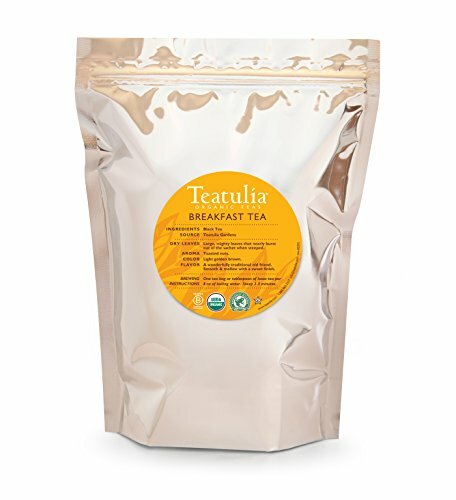 All tea sales support Teatulia's farming cooperative, which introduced a revolutionary new economic model to the region. More than 1,700 co-op members working in Teatulia's garden and surrounding communities now benefit from innovative education, health, and cattle-lending programs that help families out of the cycle of poverty. Teatulia's earth-friendly tea packaging is designed with recyclable and compostable materials made from post-consumer waste. Even our tea bags are designed with less waste in mind, free of excess packaging like strings, tags, and staples. Made from compostable materials our tea bags are GMO and chemical-free. Every decision we make is one we hope will reduce our global footprint and inspire others to do the same. Enjoy the freshest, best-tasting teas available. Sip for yourself and see. If you have any questions about this product by Teatulia, contact us by completing and submitting the form below. If you are looking for a specif part number, please include it with your message.